A council has removed £100 fines for begging after finding the penalties had little effect. The Public Spaces Protection Orders (PSPOs) were introduced in five areas of Southampton in April 2016. Southampton City Council said: "Few of these fixed penalties were paid and they did little to change the behaviour of these individuals." Business leaders had called on the orders to remain because of a recent "worsening of the begging problem". Since the PSPOs were introduced, 32 fixed penalties were issued but only one has been paid. The council said there had also been one conviction for begging contrary to the PSPO. Go! 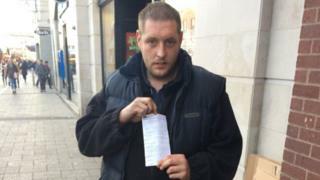 Southampton, which manages the city centre Business Improvement District, said "professional beggars" appeared to be working "on a rota basis". "PSPO is one of the few tools we have to combat the proliferation of beggars... without this we believe the numbers will increase," it said in a letter to the council. "Over the last 12 months, 60% of our businesses have reported that antisocial behaviour issues associated with begging have impacted their business." The council said other measures, including police action and issuing community protection notices to stop antisocial behaviour, had been more effective. Community wellbeing councillor Dave Shields said: "It's not working and we would rather focus on the things that will work." On Tuesday, cabinet members voted to renew the PSPOs but restrict them to cover street drinking or "loitering for the purpose of consuming alcohol". A consultation found 71% of the city's residents disagreed with relaxing begging controls. In December 2016, a Southampton council tenant and benefit claimant appeared in court for failing to pay a fine and was given a conditional discharge by magistrates. Campaign group Liberty has called on the government to scrap PSPO powers, which it describes as "vague" and "disproportionately punitive".